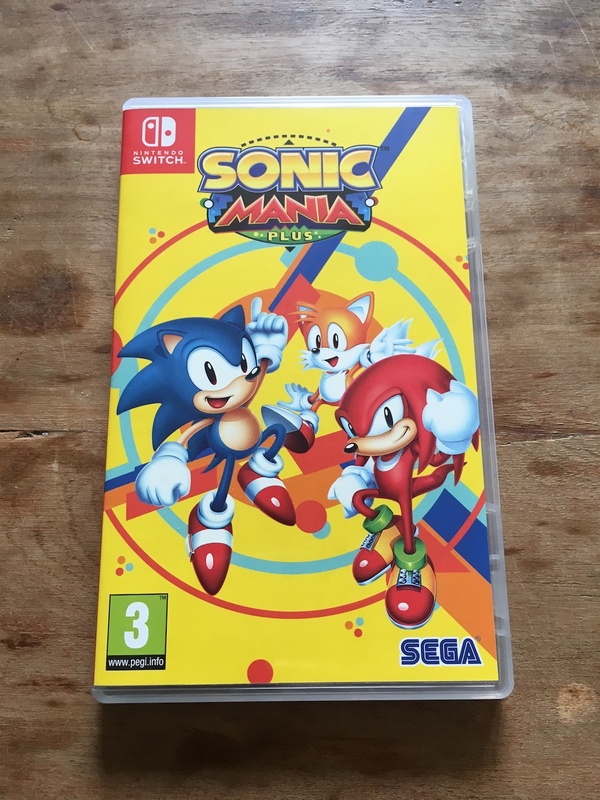 Sonic Mania Plus hits digital game stores in just a few days time! But next Tuesday is also important for the fact that it will mark the first time that the 2017 platformer will be available in physical format on Nintendo Switch, PS4 and Xbox One. We’ve had a review copy sitting in TSS Towers for a while now (review coming soon! ), but we thought we’d share what you can expect to find in the physical package to help hype up next week’s release. Read on to find high-quality photos of everything! 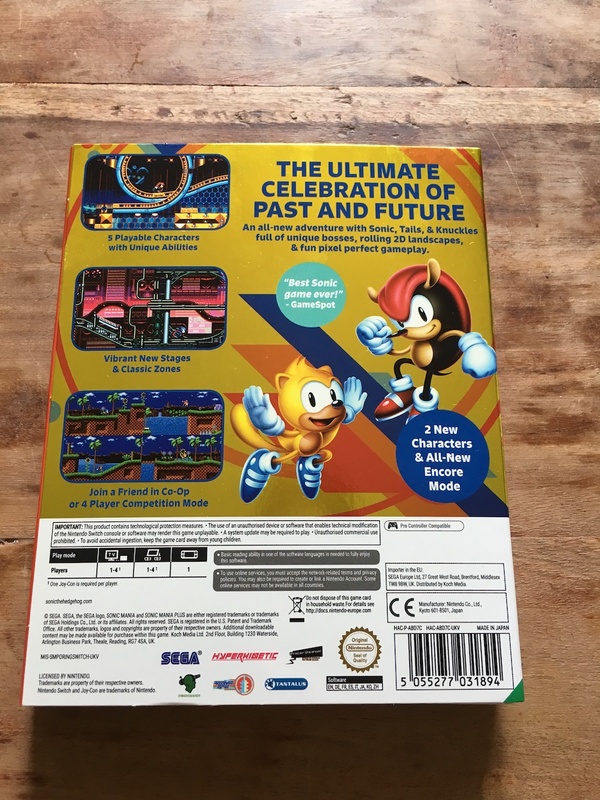 The front of the outer box has some cool reflective material baked into it, meaning that Sonic, Tails and Knuckles will shimmer as you move the pack from side to side. As this sleeve is the size of a standard Blu-Ray box, the Nintendo Switch version (displayed here) will include an empty box inside to make up for the space lost with the Switch’s narrower box. 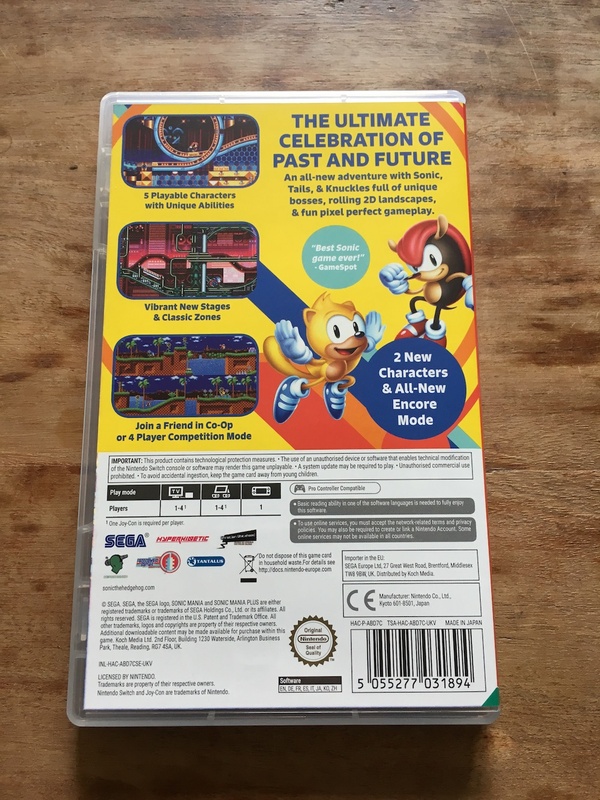 The cool reflective box continues on the back of the sleeve, with the blurb promoting the new features found within the ‘Plus’ package: four-player multiplayer, remixed stage designs in Encore Mode and the return of classic characters Mighty and Ray. 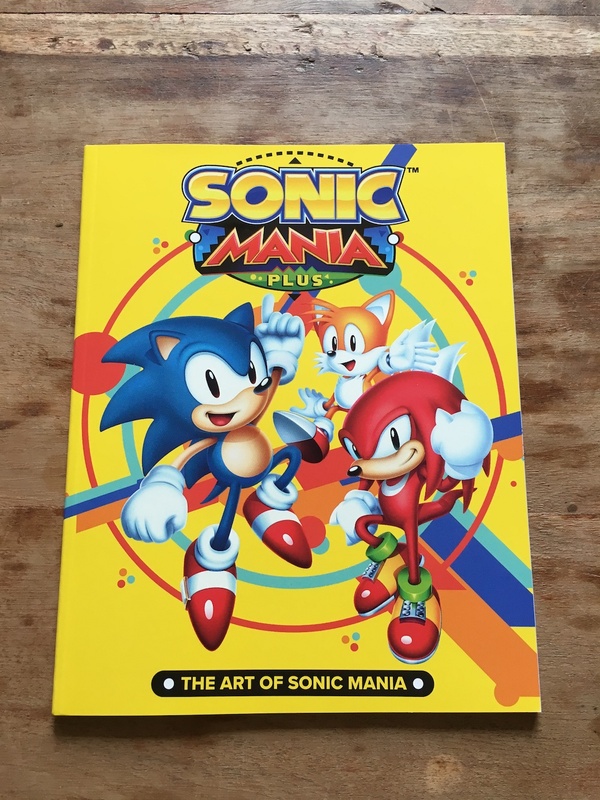 Take everything outside of the sleeve and you’re presented with the game box itself, which we will look at in just a moment, and an extra little bonus: an Art of Sonic Mania booklet. Now, let’s take a look at the box itself. 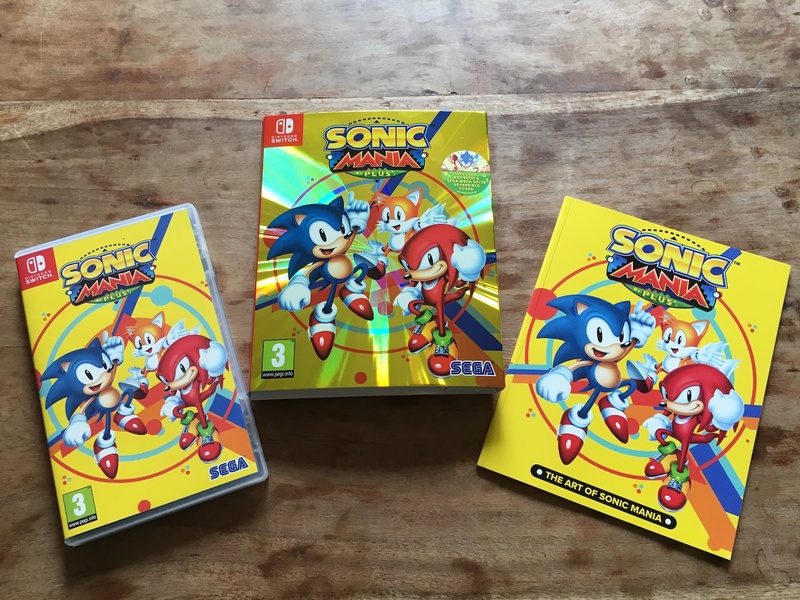 For a lot of die-hard Sonic fans, it will be quite a feeling to finally get their hands on a physical copy of last year’s platforming masterpiece. 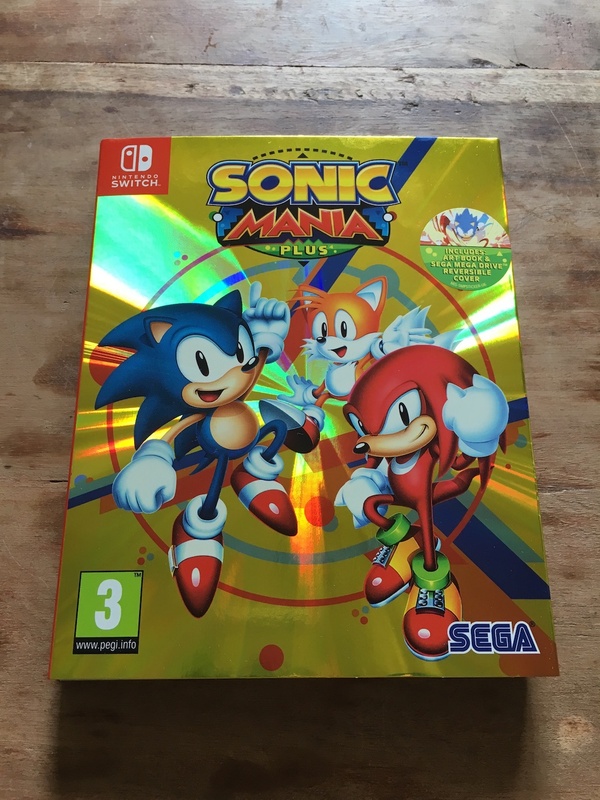 But, there are also a bunch of people who don’t like buying digital copies of games as well, so for those people this will be the first time they will even get to play Sonic Mania at all. 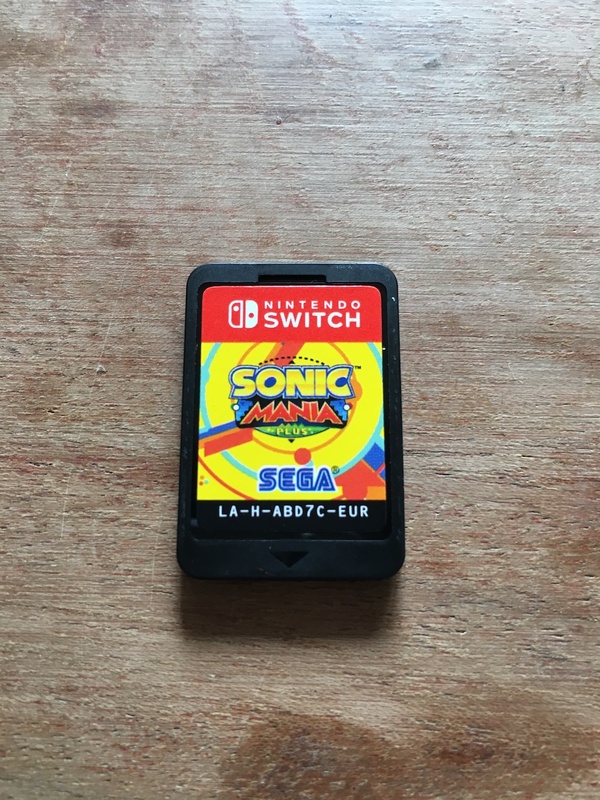 What you see on the right hand side there is the Nintendo Switch game card (which you can see in full below), and a small card which simply contains health and safety guidance and customer support details. But behind all that? 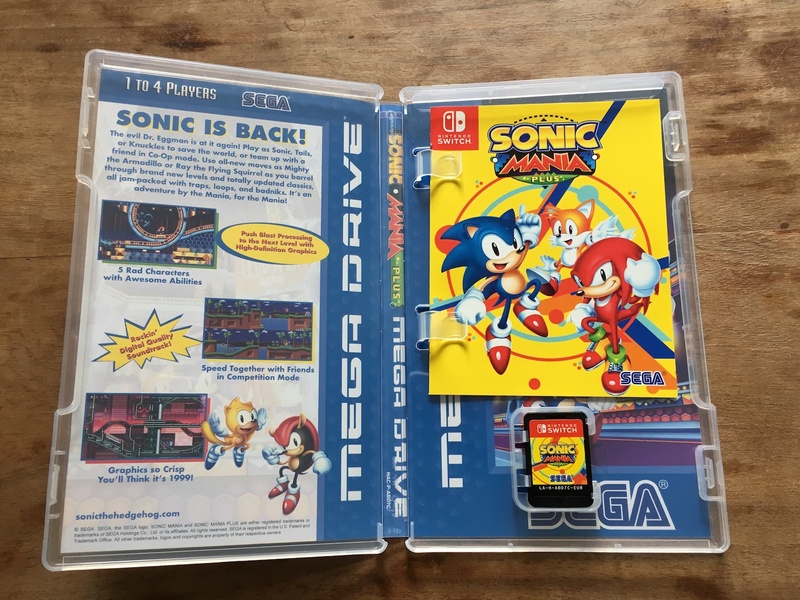 Yep, that’s a reversible cover for the box! Let’s take it out of the box and take a look at it in full. 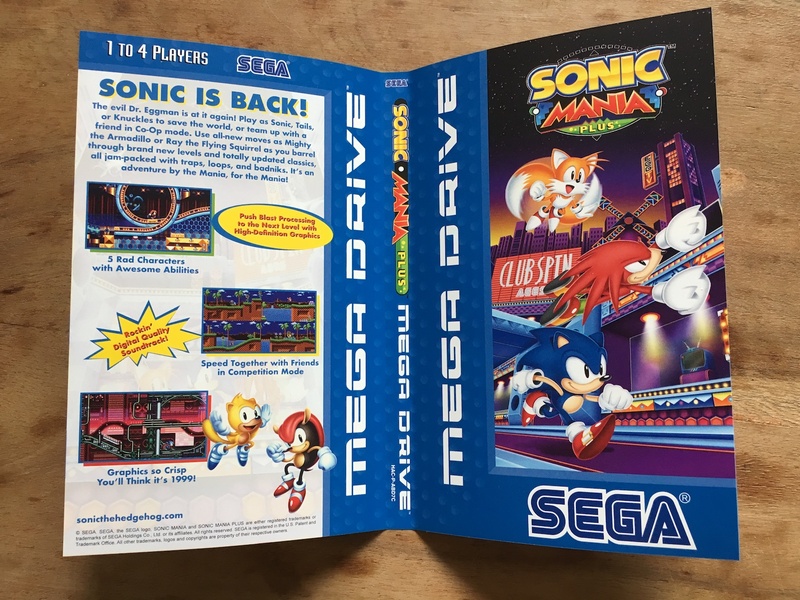 As you can see, it’s a box cover that is designed exactly like a classic SEGA Mega Drive Sonic game! 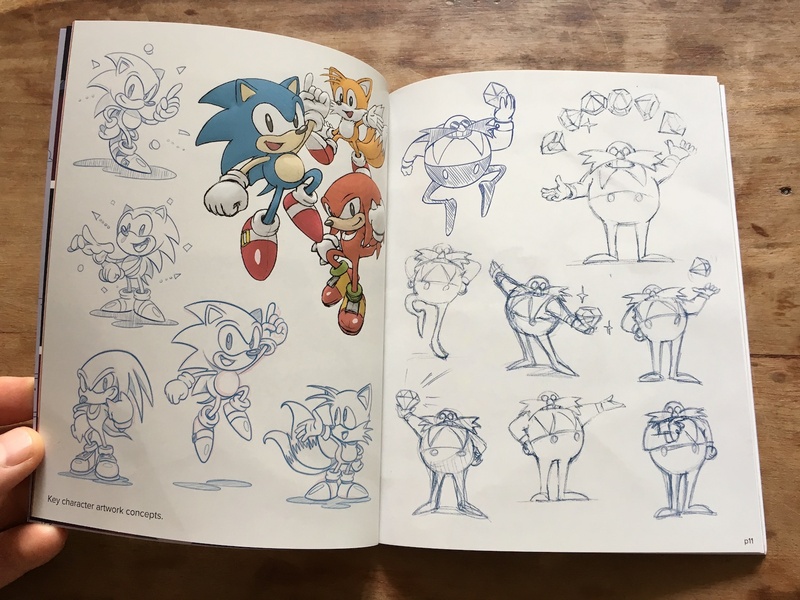 Fans who have been keeping a close eye on the development process and marketing of Sonic Mania since early 2017 might recognise the key art on the right there, that was given away as posters at various conventions over the last year. 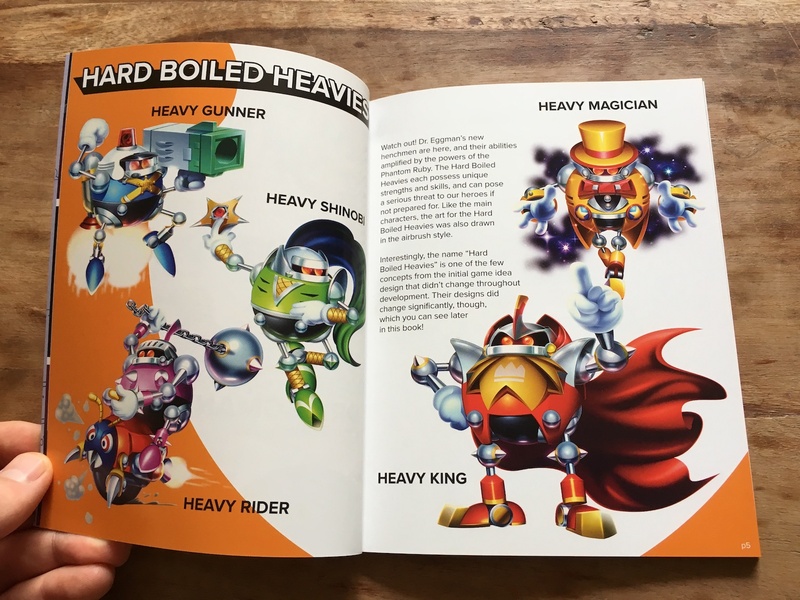 But everything else is a perfect homage to post-1995 Mega Drive cover design language; from the ‘1 to 4 Players’ typography on the back cover to the Mega Drive logo placement. Place the alternative cover on the box, and I have to say, there’s something really rather majestic about it. ’90s kids will definitely swell up with nostalgia and have a big beaming smile on their face. 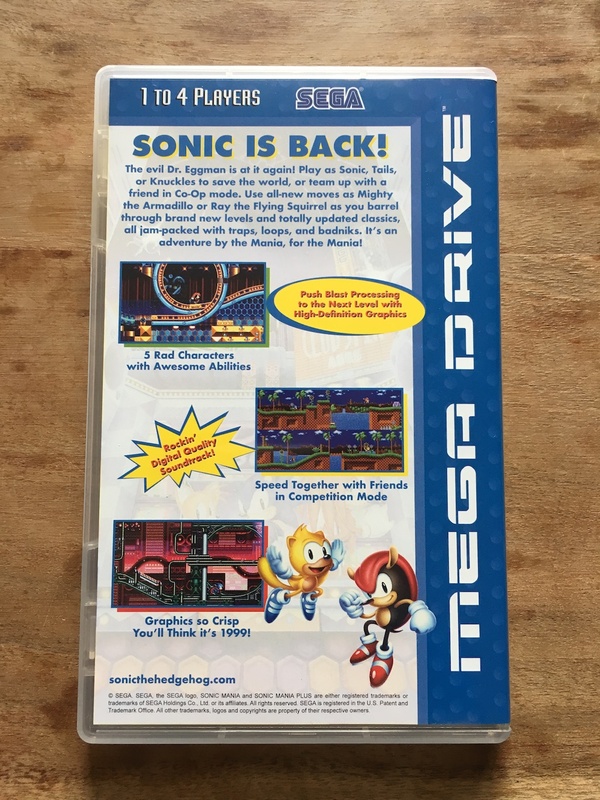 The blurb on the back cover has also been completely re-written to match the marketing style of the 1990s – ‘Rockin’ Digital Quality Soundtrack’, indeed. And you’re probably wondering what the reversed-cover box would look like on your game shelf. Well, wonder no more – we’ve taken a photo of that for you too. 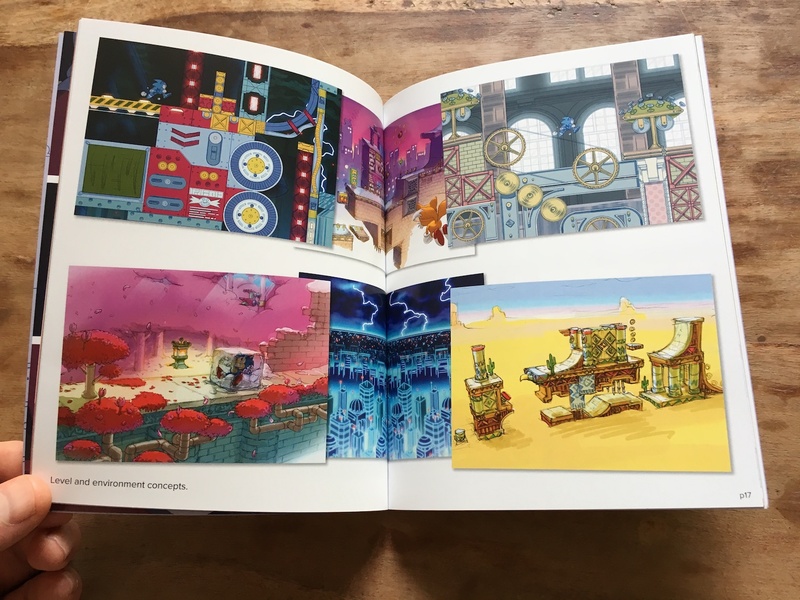 We hope this gallery has given you some insight into what you can expect when your copy of Sonic Mania Plus arrives on Tuesday – let us know how excited you are for this updated release in the comments section below! 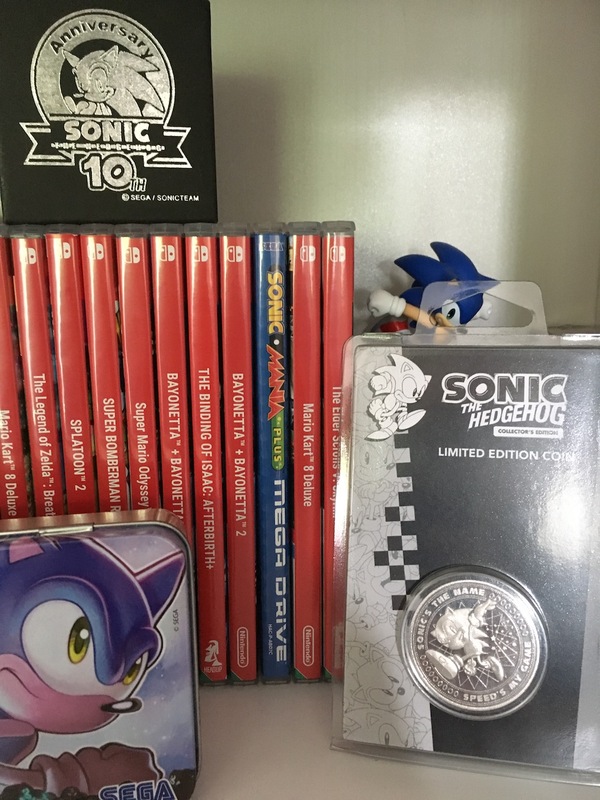 < Previous Post Previous post: The Spin: Why Can’t EU Order From The Sega Store? I’m assuming American versions will use the Genesis logo? Still, this is absolutely amazing. 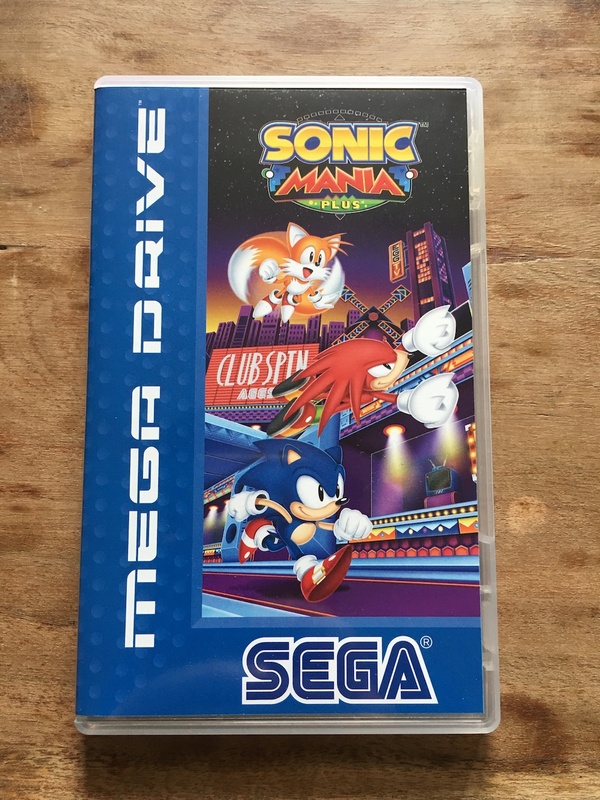 Does our data from Mania if u got it digitally carry over to Mania Plus in the physical version?